Po’boys are not something that those of us hailing from places other than the south are usually familiar with. Originating in Louisiana, they usually contain meat or shrimp and are served on a nice piece of French baguette. The origin of the name is disputed, but all can agree that this sort of sandwich is very delicious! This one is particularly good, involving spicy shrimp and remoulade sauce. I (Celine) viewed this sandwich with a little trepidation because I’m not normally a fan of shrimp because of its texture and taste. Thankfully, this was a hit with everyone! The sauce is so good- it’s creamy but with the added snap of spiciness. We both felt that it would go very nicely with chicken as well. The key is getting good baguette, and cooking the shrimp perfectly so it doesn’t get rubbery (which I am happy to say we managed to do!). This sandwich feels summery and fresh, which is very welcome in during this sort of cold March! Try it, and we are sure you will love it as much as we do. Stir together all of the ingredients for the remoulade sauce in a bowl. Adjust seasonings to taste. Chill until ready to use. To prepare the sandwiches, combine the shrimp with the olive oil and cajun seasoning in a medium bowl. Toss well to coat the shrimp. Heat a grill pan (or a wok- that’s what we used) to medium-high and cook the shrimp just until pink and opaque, about 5-10 minutes, turning several times. Remove the shrimp from the pan and set aside. Slice the baguette into 4 servings, and cut horizontally to open it. Spread some of the remoulade sauce onto both pieces of the baguette. 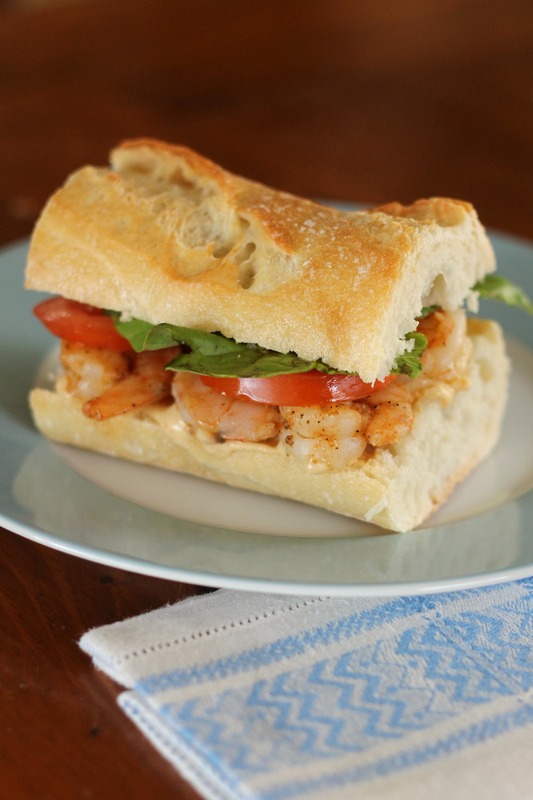 Layer the bottom slice of bread with shrimp, then top with lettuce and tomato as desired. Top with the remaining piece of bread and serve immediately. Enjoy! Side note: You’ll almost certainly have extra sauce. If you wish, halve the recipe so that you don’t have leftovers.